“Mommy, fall is almost coming! The tree is changing colors! It’s just going to be here in a few more days!” That’s what Doodles announced to me this morning as he was going down the stairs and looked out the window at the maple tree that peeks over the top of the granary at us as we go down stairs each morning. I realized recently that that tree is how I gauge the coming and going of the seasons. Fall is almost here. As much as I am looking forward to the change in season, the reality of how much work needs to be done in the next 2.5 months is really starting to sink in. While we are nearing the end of harvest season, the harvest continues. And in addition to the work of harvesting and cleaning up the garden, we have so much work to do to prepare our homestead for winter! I’m ready for fall, but not for winter! This post does contain affiliate links. To learn more, please read the disclosure statement in the side bar or bottom of the page if you are on a mobile device. 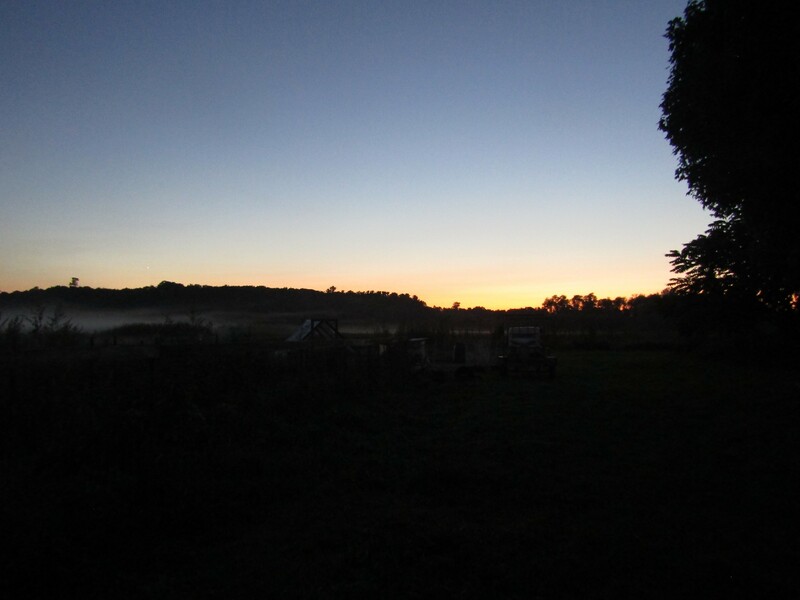 There’s a burning barrel to be emptied and moved, grass to be cut, a winter coop for the chickens needs to be built, the dog’s winter living situation worked out, the garden shed repaired, and countless other tasks to complete before the frost sets in and the first snow flies. My energy is still pretty limited, though it’s gradually improving, but while that improves, my belly expands making it more difficult to work on many of the things that need to be done. I’m trying not to let the pressure get the best of me and remember to take it just one day at a time. That’s why I was so grateful when my mom said she’d be willing to help me out with gardening and harvesting stuff once in a while over the next couple of months. She came over on Monday to lend a hand, and I was just amazed at what a difference it made to work with another adult. Most of the work falls on me around here because of Scott’s schedule and the kids’ limited abilities at their ages. Over the weekend, Scott worked on coming up with a solution to some of our garbage problems (we can’t always burn everything right away, and we can’t dispose of all non-burnables and recyclables right away either), fixing the lawn mower, and doing some repairs on our garage roof. We need to wait for another rainy day to know if all of the problems are fixed, but it seems like what he did should do the trick. We were getting a lot of water in the garage, which was kind of okay, so long as we had our woodworking tools put in the right spots to avoid getting rained on. And he typically has to run into town at least once to pick up parts, tools, or supplies for whatever it is we are working on over the weekend. We didn’t accomplish as much as we could have because Doodle’s birthday was on Saturday and we took some time to celebrate. However, Miss Lady and I harvested the very first of our pumpkins. When Mom was here on Monday, we were able to accomplish a lot. We started by hulling tomatoes and freezing them. Then we went to the garden and harvested as much of everything as we possibly could. All of the ripe or semi-ripe tomatoes were picked and brought inside, another few handfuls of pole beans were picked. The last of the black beans were picked, and the first of the cantaloupe was harvested. 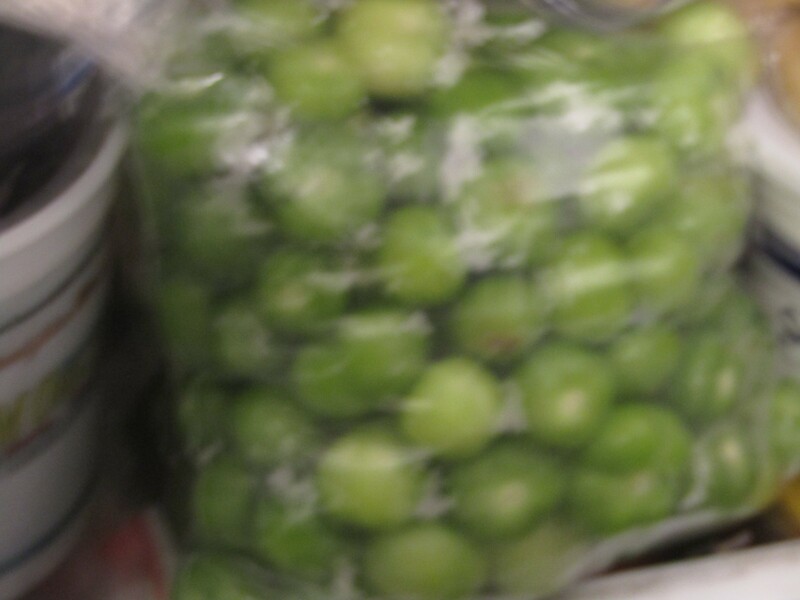 We picked green bell peppers and several jalapenos, as well as a rogue onion. There were watermelons to pick and the first of the cabbage was ready to harvest. Yet another bushel of tomatoes… what a blessing! We brought everything in and worked on dealing with it all right away. The ripe tomatoes were also hulled, but these were put in the fridge so I can make diced tomatoes. The rest were put back in the basket and are being picked through as they ripen. We refrigerated the pole beans and shelled the black beans. One cantaloupe and one watermelon went home with mom, and we cut another watermelon open for lunch. The jalapenos were refrigerated until I can make Hot Pink Jalapeno Garlic Kraut, and the bell peppers were diced and frozen for future use. Diced green bell peppers, freezing on a pan, waiting to be transferred to a freezer bag. Once we finished all of that, we went hunting for volunteer tomatillo plants and ripe pumpkins. There are plenty in the pumpkin patch that are ready or near ready, but we’ll wait another week or so to do the bulk of the picking. 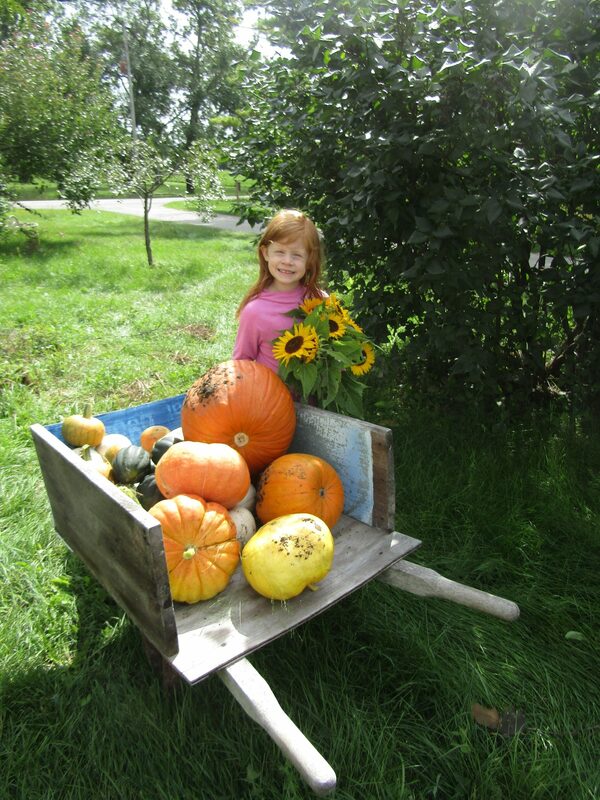 We also picked a bouquet of sunflowers for Mom, and went on a hunt for pretty fall foliage for our craft project. When we got back into the house, we started to work on shredding cabbage to make my first ever batch of sauerkraut (it was Mom’s first time making a batch as well). We weren’t very far into the process at all when I sliced the tip of my thumb off on the mandoline. I guess that’s what I get for not using the safety guard. I attempted to use it, but it felt uncomfortable which made me feel unsafe, so I decided not to use it. 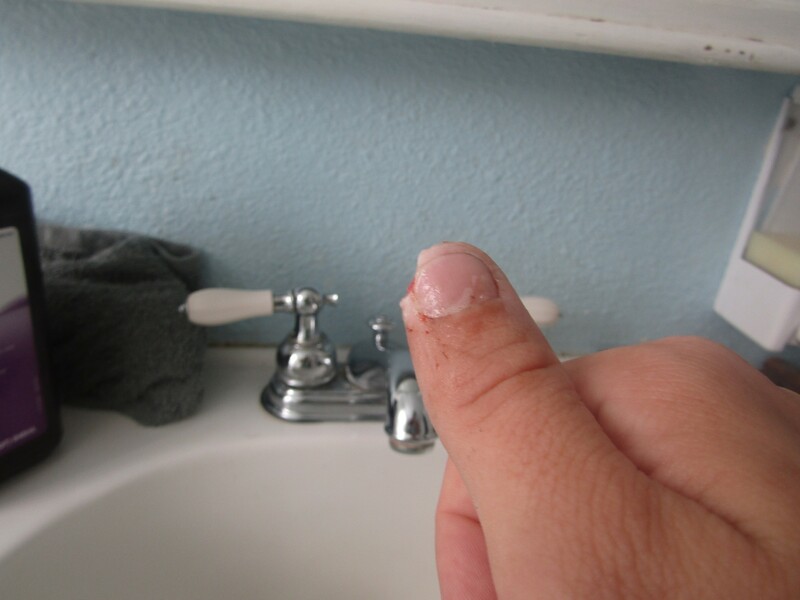 My thumb looks…gross, but it will recover. There’s a good chance there will be a bit of a divot in it after it heals, but it still functions and I didn’t cut to the bone or through the nail bed. Needless to say, I did not finish that job. Thank goodness Mom was there though, because she was able to help me clean and bandage my thumb. The shock of the cut and the pain of the cut both left me feeling slightly light-headed and nauseous, and seeing as the injury was to my right hand, it would have been much more difficult for me to clean and bandage on my own. After I was all cleaned up, I put on a rubber glove to keep my thumb dry and clean, and she took over the chopping of the cabbage… without the mandoline. After it was all chopped, I salted everything and let it sit for some time. While it was resting, we started to work on our craft project. Mom had sent me a video on Facebook of these decorated white pumpkins and I said that we could and should try it. 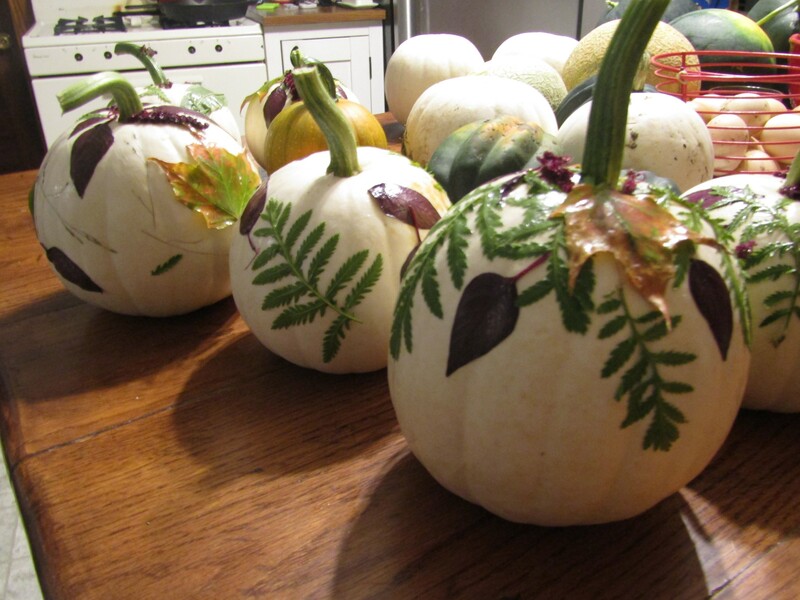 All you need is some foliage or flowers, a pumpkin, decoupage glue, and a paint brush. It was a pretty easy project, but after getting started, we realized that some foliage was much more cooperative than others. The leaves of the amaranth worked the best, and honestly, I liked the contrast of the maroon against the white the most. They dried nicely, and though they didn’t turn out quite like we had hoped, they still turned out pretty well considering. Some of the kids also decorated pumpkins with us. 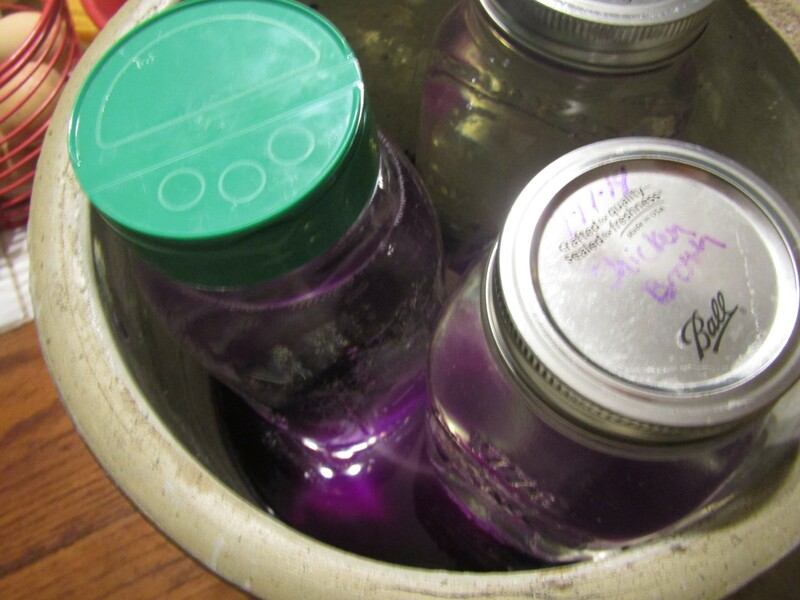 After the pumpkins were finished, I finished packing the sauerkraut into the crock until the brine covered everything and put a plate and some mason jars filled with water into the crock to cover the cabbage. I’ll be attempting another batch of sauerkraut pretty soon (the recipe I mentioned above), but this one will be done in mason jars. 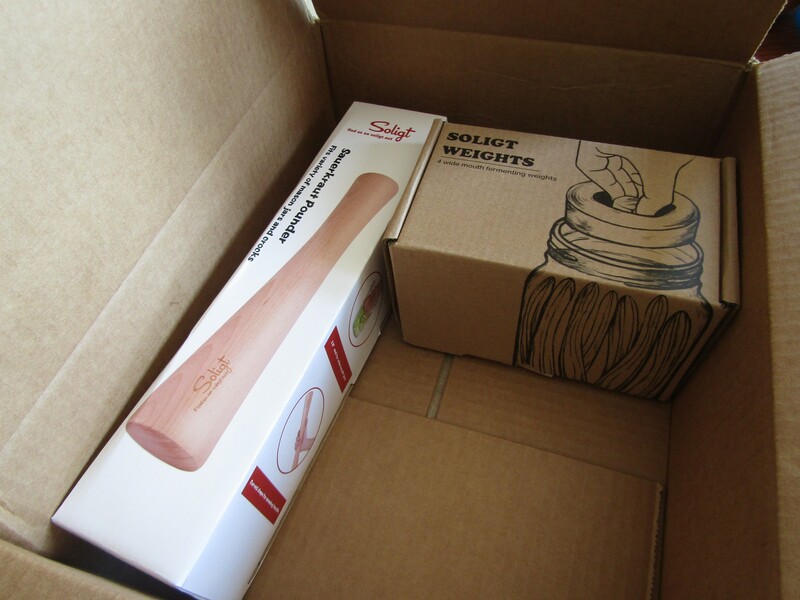 I know you don’t need fancy tools to do the job, but because it would be much easier to pack the kraut into a jar with a pounder, and a glass weight is much more convenient than trying to hunt out the appropriate sized rock, I decided to order those tools to make the process easier. They arrived in the mail yesterday, and I think I’ll work on that kraut in the next week or so, after the cabbage in the garden has grown a little bit larger. Yesterday, I busied myself on non-harvest projects. The boys and I emptied two of our burning barrels and moved them to a different location in the yard (they still might get moved again, but it’s going to be a lot easier for me to deal with garbage if it’s not so far from the house). There is still one more to be emptied, but it can wait until after the weekend when the worst of this plague of mosquitoes and the heatwave die back. I spent a good chunk of time dealing with garbage throughout the day. Laundry has gotten behind once again, so I did the loads that needed it the most, and then I assigned days of the week to the kids so they can start to do their own laundry. With a growing belly, it’s getting harder all of the time, and quite frankly, they are now big enough and I just don’t have the time. They typically help me fold and put the laundry away, as well as bring it into the basement, but now they’ll be accountable for all of their laundry. I finally got around to emptying out the tanks we used as brooder boxes. It’s just deep bedding, but it needed to be emptied and they needed to be cleaned. I’m glad to have finally completed that job! The bedding is in the temporary chicken run where it can dry out, and also the chickens will be able to spread it around and look for more bugs in it. I’ve been waiting to harvest potatoes, but I think that today I’m really going to need to get that project underway. The plants are really starting to die back, and I want to harvest them before the stems completely die and I can’t find them anymore. I’m planning to just cure most of them, but I might can some, and I’m going to borrow my sister-in-law’s food processor to make up a bunch of hash browns. We use them a lot for our favorite breakfast recipe. Speaking of my sister-in-law, we decided to split the cost of a honey extractor with her, and sometime soon, we’ll be working on extracting our honey for the season! She harvested a lot more than us, but Scott still needs to go back and check to see if more of the honey is capped and ready to pull. I’ve noticed the bees spending a lot of time on the sunflowers recently, so I’m hoping that they’re getting the food they need to do their work! Whether it’s honey, pumpkins or potatoes, the harvest continues… What have you been harvesting from your gardens, fields, and orchards? What are you most looking forward to baking or cooking with the food you harvest? I do! Quite often, actually. Although they don’t help a ton with food preservation at the moment, mostly because I’m still learning a lot and it’s easier for me to learn by myself. I started working on a post about them working in the kitchen months ago! Maybe I should finally finish that up… There’s plenty they can do. One of the kids actually wanted to use the mandolin, but I was so nervous about it that I said no… and then and went and sliced my finger off. At least it demonstrated why I was so funny about them using it!